June is the month of the light. Next week in Scotland, it’s midsummer’s day – the shortest day of the year (you’d never know we’re in the middle of summer, given all the rain and wind we’ve had!). So, I’ve been thinking again about light. 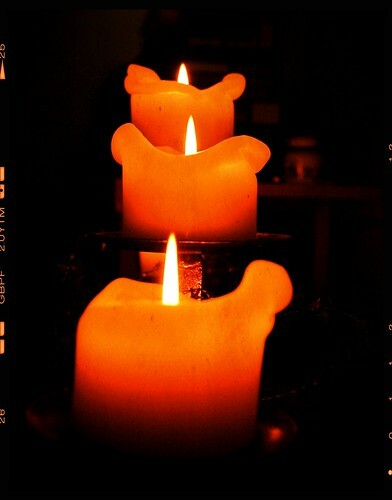 Candle light in particular reminds us how sharing light increases it. Have you ever lit one candle from another? When you do, the first candle doesn’t get any dimmer. By lighting one candle from another, you end up with more light. I wonder what kind of light I bring into this world? You might like to wonder about what you pass on to others too, because, although we might not physically pass light to each other, we certainly pass our emotions, our attitudes, our way of being onto to those around us and spread them the way that light can spread. Around the turn of the year, when I was thinking about my Life (with a capital “L”), I played with this idea of light and I thought, actually, what I try to do, as a doctor, can be captured in three verbs about light. Firstly, I try to lighten others’ loads. I try to ease their suffering. If I didn’t achieve at least that, I’d not be much of a doctor. I hope that everyone I see has their life, or the burdens in their life, lightened a bit as a result of my care. But that’s not enough for me. I don’t want patients to come back and just say they feel a little lighter. I want their lives to be brighter. By that I mean I hope their days become better days, more fulfilling, more colourful, brighter days. I hope for others, and I hope for me, that life becomes brighter, and by that, I really mean an increase in that “emerveillement du quotidien“. But even that’s not enough for me. I hope, at best, to enlighten, to show new possibilities, to support and stimulate new growth. I just love when I hear that a patient’s life has become lighter, brighter and, yes, transformed – that they’re experiencing a personal enlightenment. If you think about light this month, why not think of it as a metaphor, as well as a physical phenomenon? What metaphors of light seem most relevant in your life?